This hall console accent table the perfect way of adding contemporary styling to your home. Ideal for entryways, hallways or anywhere you would like to showcase your favorite accent pieces, this table will blend seamlessly with any dicor. Featuring a metal base with a clear tempered glass top, this fashion forward piece will provide years of lasting enjoyment. 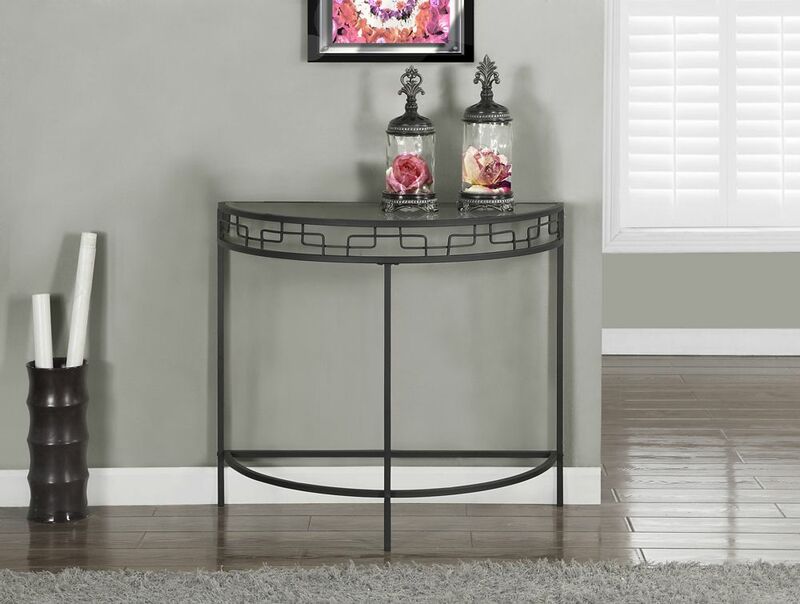 Charcoal Grey Metal 36"L Hall Console Accent Table This hall console accent table the perfect way of adding contemporary styling to your home. Ideal for entryways, hallways or anywhere you would like to showcase your favorite accent pieces, this table will blend seamlessly with any dicor. Featuring a metal base with a clear tempered glass top, this fashion forward piece will provide years of lasting enjoyment.